This morning, 350 students at Valley Academy of Arts and Sciences in Granada Hills are getting computer devices. The rest of the school’s 800 students already have theirs. And, by next week five schools will receive iPads, laptops and Chromebooks. 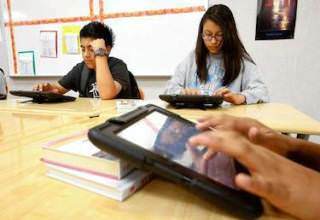 Another 30 schools are in line for their devices, 19,000 of them, said Sophia Mendoza, the interim director of the Instructional Technology Initiative at LAUSD. This is all part of the steady progress that the district is making in expanding the use of technology in the classrooms in the aftermath of a botched $1.3 billion iPad program that effectively delayed the accelerated use of technology in classrooms by more than a year. Change — and improvements – are coming. But slowly. For example, most of the 70,000 tech devices have been delivered to the “one-to-one” schools designated for a device for every student by the time school started in mid-August. By the middle of this month they should all be distributed. That’s quite a bit faster than the months-long process it took to hand out 47,000 devices in the entire 2014-2015 school year. At a press briefing on Wednesday afternoon with new and longtime leaders in the the district’s technology departments, administrators described some of the progress, as well as the remaining issues facing the district in completing the project. So far, 101 schools are participating in the program to get an iPad, Chromebook or laptop to every student and teacher on campus, and allow them to take the devices home. “We are showing the students how to take pride and responsibility over the use of these devices, so no, they won’t be using them as Frisbees,” said Bill Wherritt, a Facilities Division official who is overseeing the device deployment to the schools. Before a school can get these devices, they have to have a strategic plan showing how the computers will be used for instruction, how parents will be involved and have a person assigned to track the devices and oversee training. Mendoza and Linda Del Cueto, chief of Professional Learning and Leadership Development, were among the tech executives who attended a principal’s meeting yesterday to explain some of the procedures. Principals were surprised that the process could be so quick. In the two years since the tech program has begun, 150,000 devices have been bought by the district, and schools have purchased another 85,000 outside of the program through local fundraising, grants and donations. At the moment, they have to get WiFi for all the schools. Some Internet connections are spotty, if at all. The school board approved high-speed wireless networks for every school district wide, and the report showed challenges remain. As one example, the report found that 40 percent of the elementary schools did not meet the district’s bandwith specifications, and many schools had trouble getting online. Meanwhile, there’s no prediction about when and whether every child in LAUSD will have a device, as previously envisioned. That decision, and that plan, will come from the Instructional Technology Initiative Task Force formed in April. Their first meeting is scheduled for Sept. 10.